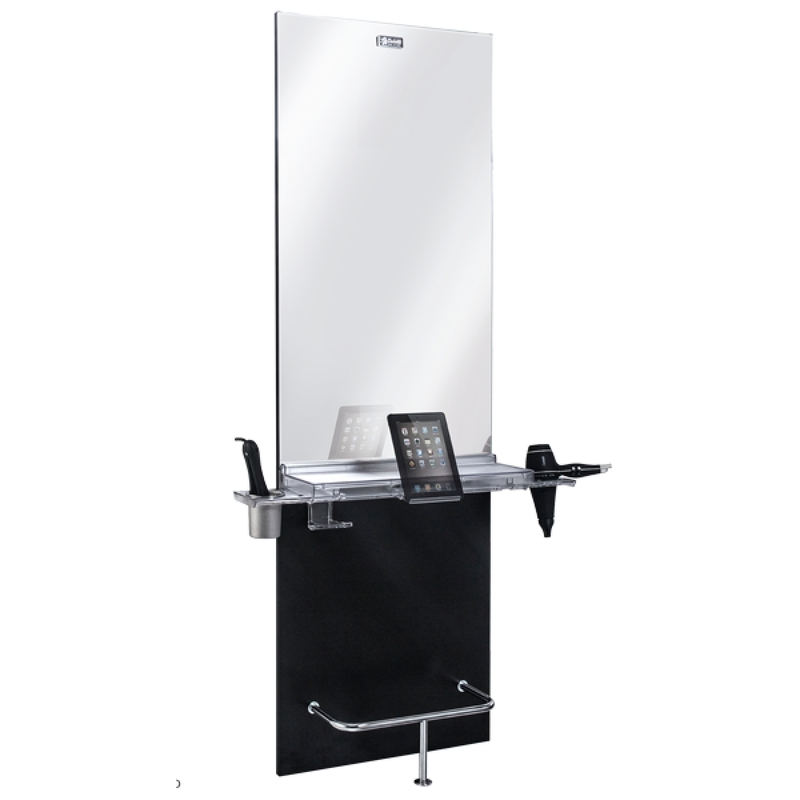 Have the most stylish salon around with this high quality, modern salon and stylist mirror straight from Italy. This professional mirror is laminated wooden board with a worktop in SAN with aluminium support and multifunctional accessories, glued mirror and is also available with LED lighting which makes this mirror highly functional and beautiful and would make a great addition to any salon. 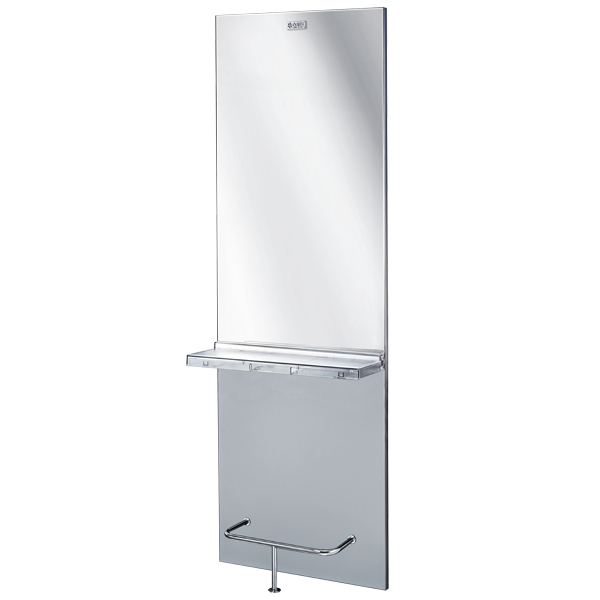 Ceriotti EKO+ Mirror with laminated wooden board. Worktop in SAN with aluminium support and multifunctional accessories and glued mirror. Available also with LED lighting. We want you to be satisfied with your purchase. If for any reason you are not satisfied, you may return your product, provided it is in unused and new condition, and it is within 30 days of your delivery date. All damaged/defective items must be reported within 5 days of the delivery date. We are not responsible for return shipping. All authorized returned items are subject to a 25% restocking fee, items may be exchanged for store credit plus shipping cost. We do not refund shipping/handling. Returns will not be accepted without a prior authorization. Returned items must be in new and unused condition, and with all original packaging. Absolutely NO returns and/or exchanges on special or custom orders. Regal USA cannot and will not be responsible for work performed by others. Regal USA will NOT accept any return on Shampoo Units that have already been installed or connected to plumbing. If a package is received damaged, please refuse delivery. Concealed damage reported within 48 hours and all packing materials and carton must be saved for inspection or the shipping company will not pay the claim. After 5 days, returns or claims of damage will not be honored. Any returns sent to Regal USA without receiving a prior authorization will be returned to the sender unopened. Shipping charges and expenses are not refundable and will be deducted from the final refund amount. We strongly recommend that you fully insure the package you are returning. This is for your protection, in the event the package is lost or damaged in transit. Regal USA offers a one (1) year warranty on the above referenced tools. Tool(s) will be repaired or replaced if it cannot be repaired. This warranty only covers for manufacture defects. Contact your Regal USA Customer Service Representative and inform them of your request to return an order. Confirm shipping arrangements with your Service Representative, and re-package merchandise as it was upon delivery. After shipping charges have been deducted, along with any additional return/re-stocking fees, you will receive your payment/refund. Proper reimbursement credit, or exchange will only be allowed on authorized returns. Please allow up to 10 business days for your refund to process upon receipt of your return. • We must be contacted within 5 days after delivery date for acknowledgement of damages; we will not be responsible for replacement anything after 7 days. • Returns: Accepted within 5 days and YOU pay the return shipping charges. • All refunds are applied to the same method used in the initial purchase. • All returns must be returned in its original packaging and in original condition. • All returns are evaluated and subject to a 25% restocking fee excluding original shipping cost. We will open the box to ensure all parts are included and in like-new condition. • Buyers are responsible for all and related returning shipping cost. Returning Damaged / Defective Items. In cases of damage or defect, the return process can often be expedited by providing a digital image of the damage or defect (along with a clear description of the problem) in an email to our customer support team at info@new.regalhaircolor.com. In many cases, action can be taken as soon as substantiation of the claim has been provided by the customer. If the damage / defect cannot be verified over the phone or via email contact, the item may be required to return to info@new.regalhaircolor.com for inspection before a determination can be made as to the state of the product. There will be a 25% restocking fee on all items approved for return. We will accept merchandise for return ONLY within 30 days of receipt, provided that the merchandise is in original condition, the customer has all original materials, accessories, and packaging. Returns are for credit only, minus the shipping fees. Fees may be increased if shipments are returned to us damaged or without original box. Regal USA will NOT accept any return on Shampoo Units that have already been installed or connected for plumbing. Customers must contact our customer service department for an Authorization Approval number prior to a return. All returns are subject to inspection before approval for a refund. Absolutely NO returns, exchanges, or cancellations will be accepted on customized/special ordered merchandise or non-stock merchandise. Any attempts for a return past the 5 day window will remain at the discretion of Regal USA, Shipping charges are non-refundable and the customer will absorb all applicable fees. The customer is responsible for providing proper packaging and may be held responsible for any additional shipping fees (i.e. call tags, shipping insurance and repackaging). Any merchandise received not in accordance with the above stated policy will be denied return delivery acceptance. All returns will be carefully reviewed and authorized at the discretion of Regal USA. Please call our office if you need further assistance with return details (800-734-2593). Any damages to returned products are the sole responsibility of the customer and such damage claims are between the carrier and the customer. Shipping damage is rare but if it does happen, a satisfactory resolution is dependent upon your actions at time of delivery. The shipper, when delivering, will ask for a signature that all was received in good order. You MUST inspect the items you are signing for BEFORE you sign for the goods. If you see any damage to the box or anything that would indicate hidden damage, it MUST be noted on the delivery receipt. If the product is damaged, we suggest you refuse the shipment. If you fail to note the possibility of damage on the delivery receipt, you will find it VERY difficult to obtain any relief from the shipping company, should you have damage that was not noted on the receipt. If you have ANY concerns about damage, we strongly encourage you to call the shipper's local terminal and speak to the manager about your concerns before the driver leaves. Regal USA is not responsible for shipping damage. The shipping company is responsible for shipping damage. If you sign for a delivery that is damaged, you accept all responsibility for the shipment and any damage that may have occurred during the shipping of your goods. Shipping charges are nonrefundable. The guideline applied to orders where customers received free shipping: Customers receiving free shipping will be credited the full purchase price of all products returned minus the shipping cost if their entire or partial order is returned for a refund. Once the equipment is shipped out and customer cancels the order for whatever reason, there is 25% restocking fee on any equipment not made by Regal USA manufacture. Customer can cancel the order till 2pm next business days. All refunds will incur a 5% administrative cancellation fee. Regal USA will hold the equipment for the customers in our warehouse only if the items are paid in full. If customer after period of 14 business days cancels the order, Regal USA will charge the storage fees 30% of the original purchase price. Have the most stylish salon around with this high quality, modern salon and stylist station straight from Italy. This laminated wood structure has optional supports for hairdryers and a mirror glued on a chromed ABS frame makes it highly functional and beautiful and would make a great addition to any salon. 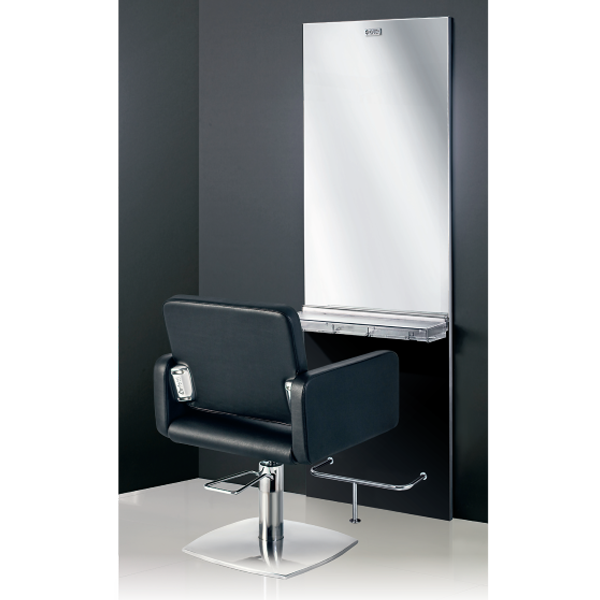 Have the most stylish salon around with this high quality, modern salon and stylist station straight from Italy. With a worktop in ash plywood, laminated and coloured, equipped with hairdryer holder, glazed aluminum footrest, structure in ash hardwood, multilayer mirror it is highly functional and beautiful and would make a great addition to any salon.